The flowing of Awen isn’t just an experience, it is a magical and meditative process. Perhaps you’ve experienced it yourself–when you have a moment of inspiration and then begin to create, losing all track of time, all sense of where you are or what is going on around you–the thing you are creating is the only thing that matters, and you flow with your media. Hours or days later, you emerge with something incredible. 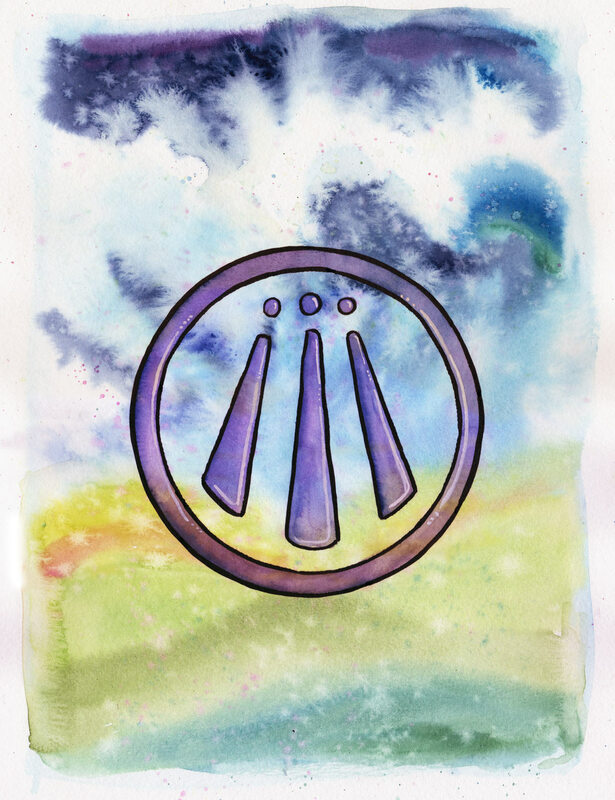 Today, bringing the flow of awen into one’s life and connecting with one’s creative expression is one of the core aspects of the path of druidry. 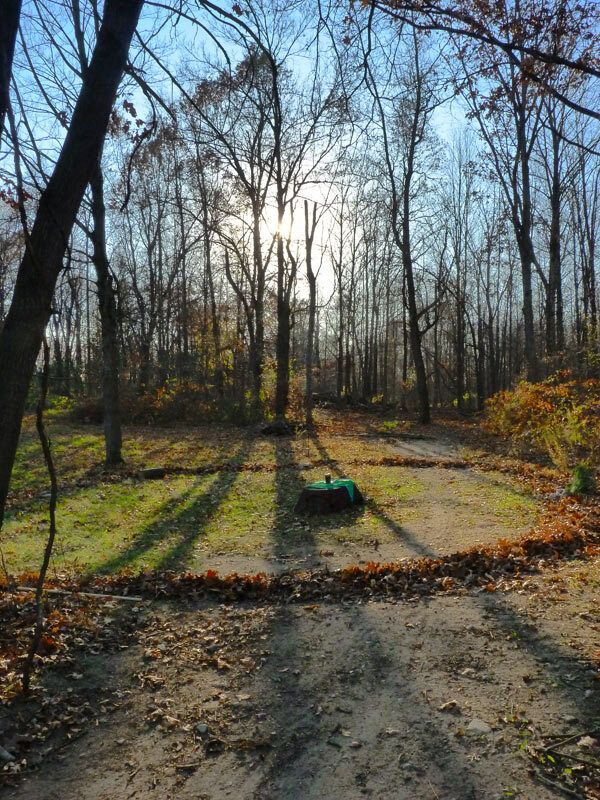 The druid path is one that embraces creativity, especially, the creativity inspired by nature. How does the awen flow? How can we invoke it, channel it, and bring it into our lives? And what is the benefit for doing so? This post represents my first in a longer series on the Bardic Arts, that is, a series of posts that explore the relationship between nature, creativity, and druidry. We begin this series with a discussion of awen, for it is from the Awen that all things flow. Poets like Taliesin, known as the “Chief of Bards” in the 6th century and reported author of The Book of Taliesin, spoke of the Awen not only as an abstract thing (as the poem above suggests) but also as a muse who works through the poet to bring forth great works. In the translation of the Book of Taliesin, “Awen” is frequently translated into “muse” but also as “flow” or “inspiration” depending on the poem. In some poems in the Book of Taliesin, the awen is personified (“the muse’s prophecy is…”) while in other poems, the awen is a more abstract thing “The muse flows…”). In the British Library Harleian manuscripts of the Historia Brittonium, Talhearn, a poet, is described as “tat aguen” (aguen = awen) translated as the “father of inspiration.” Other cultures, of course, have also personified the flow of creativity in the form of a muse who are deities or spirits that help the creativity flow (such as the Greek muses). William Owen-Pughe, who was a contemporary of Iolo Morganwg (from whose manuscripts helped start the modern Druid revival), offered a definition of Awen tied to “aw” (flow) and “en” (spirit). So we have “flowing of spirit” or “flowing of inspiration” as a common definition used today within the druid communities. Other terms I’ve heard used for awen in the druid community include “divine inspiration” or “creative inspiration” or simply “inspiration.” All this is to say that Awen is a force of energy that flows within us, helping us bring forth and express our creative spirits. A dig into the history of the word and concept of “Awen” can help us understand the awen deeper level. The Awen, like many other things in the modern druid revival tradition, was brought through the work of Iolo Morganwg in Barddas. Iolo drew upon existing Welsh traditions from much older manuscripts that he incorporated into Barddas. Modern druid scholars have worked to trace the Awen to much older roots. Two full (and fascinating) reports of their work can be found here and here. Of note, Angela Grant explains the research she did at the British Library to attempt to dig into the history and origins of the Awen. She reports on a manuscript she found in the Bodleian Library in Oxford, England which, she writes, “describes how the historian Nennius, on being challenged by an English scholar that the Welsh had no alphabet of their own, produced for his challenger an alphabet that bears a considerable resemblance to Coelbren, though more complex. It also contains an awen symbol (joined at the top) as one of its letters. This does not represent an individual letter but the Latin word ‘ego’ is ascribed to it : ‘I am that I am …” Grant also traced Awen back to a “proto-Brittonic root for “breath” and “breathing” that ties to the English word “inspiration.” From her research, we see that inspiration is connected to life itself–to breathing and to the ego/self. To create is to exist, to breathe, to be. So, by extension, one way we might think about the awen is that it can represent the fulfilled creative self. One of the stories that feature the Awen in the druid tradition (and is used extensively in OBOD’s teachings) is in the Mabinogion. It is the story of how Taliesin became the greatest bard of the land. In a nutshell, Taliesin was once Gwion, a boy who is given the task of stirring Ceridwen’s cauldron while she brewed up a magical spell that bestows the Awen. The blessing of the Awen was intended for Ceridwen’s son who was hideously ugly; she thought if she brewed up the Awen as a blessing, her son could at least be wise. Gwion accidentally gains the power of the Awen after having three drops from the cauldron splash on his thumb; the drops burn him so he instinctively sticks his thumb in his mouth to cool and inadvertently gains the Awen. Ceridwen is furious and begins to chase him. As part of the chase, the two transform into many animals, with Gwion barely escaping with each transformation. Gwion finally turns into a grain of wheat and jumps into pile of wheat in a barn. Ceridwen transforms into a “high crested” black hen who devours all of the wheat, including the grain that is Gwion. Inadvertently, she becomes impregnated with Gwion. She plans on killing him when he is born, but instead, abandons him on the sea, tying him in a leather bag. There, he is rescued by either a prince or fisherman, depending on the version of the story. The newborn child grows up to be Taliesin, the greatest bard of all time. (For a really delightful musical version of this tale, I’d recommend Damh the Bard’s Ceridwen and Taliesin). This tale offers a tremendous amount of insight into the Awen (and is well worth meditating upon). Some of its lessons include that awen it is something that can be bestowed–and not always when we expect it. Some of us may be struck with the Awen out of nowhere, just like Gwion when he was scalded by the three drops of Awen. The power of Awen is also a kind of initiation–the flow of awen into our lives open up great possibility. Awen is transformative. Taliesin himself says: “pren onhyt yw vy awen” one translation being as “my muse[awen] is wooden!” Or perhaps, for druids, a more fitting translation would be, “my muse is nature!” And certainly, the relationship between nature and creativity are well worth considering. This statement can be interpreted in many ways: the trees themselves are Taliesin’s muses, or perhaps, he is inspired often by the living earth. Still another interpretation might be that he is nature’s instrument for expression. All of these can be simultaneously true, and I believe, represent some of the key connections between creativity, the bard, and nature. How can we let nature be our muse? Spending time there, observing nature, paying attention to her sounds, her movements, her colors, her patterns, her flows–all of these things offer us great inspiration for stories, songs, dances, artwork, and writing. Model nature in our own creative works, and allow nature’s patterns, teachings, and inspiration to flow through us. Many artists, for example, get great joy out of “plein air” painting, where you paint outside and in the presence of that which is inspiring. Looking to the teachings of the river also provides druids with a deeper understanding of the role of Awen–and how we might use it. 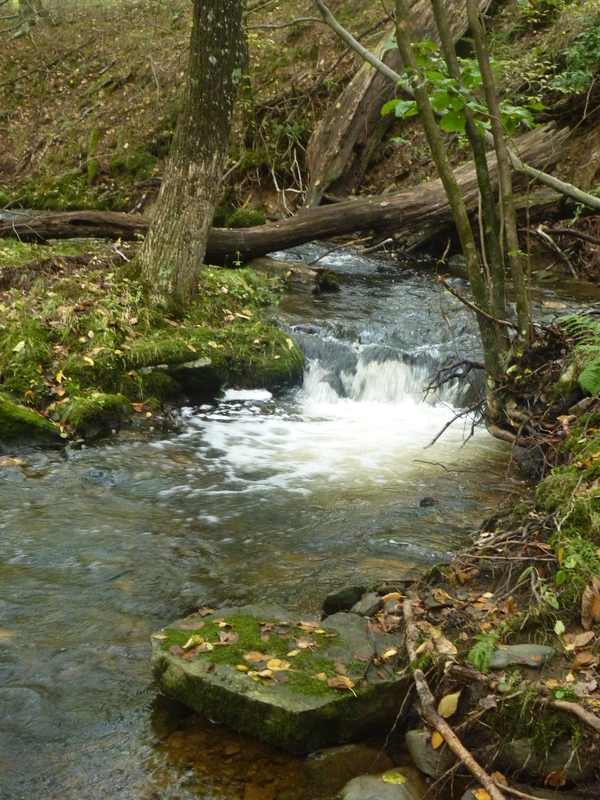 From both contemporary practice and ancient texts, we have a keen sense that Awen “flows.” Like a stream in the spring, it might gush forth from a person or be a small but steady trickle. Regardless, Awen, like the water, flows where it wants and goes where it wants. As it flows, it pours into a person, allowing them to be inspired and allow the creativity to flow back out. The more that water is allowed to flow, the more easy that flow becomes, just like well worn, smooth stones and channels along the river. Connecting to water, and recognizing that creativity has its own path that we must learn to flow with, is a critical part of the bardic arts and cultivating them in our own lives. Spending a year observing a river will show times where much of it dries up, times where much of it floods and leaves its banks into nearby fields and forest, times where it lazily moves along. In my experience, the flow of Awen is just like this. We aren’t always heavily inspired and overflowing our banks, and we aren’t always dried up and without inspiration. Recognizing the natural “ebb and flow” of awen, I believe, is part of it. But also, recognizing that we have some power over that flow as we invoke the awen and work to bring it into our lives. Connecting to water, and recognizing that creativity must be allowed to flow where it wills, just like water. Sometimes, trying to impose your own human will too much on a bardic project or performance can impede it (it is like you divert the water or put in a large obstruction that the water has to flow around). And if you are working with a personification of Awen, through a muse, he or she might not take too kindly to you imposing your own will too strongly. As we see from the tale of Ceridwen and Taliesin, Awen is not only inspiration, but a magical or divine inspiration, and thus, the more that we work with it, the more we cultivate it, the more we are able to work with the flows. My experience kayaking helps here–on a powerful river, you can expertly navigate the currents if you are experienced! Then, you can do quite a bit, but still only react and flow with the river, rarely paddling against it. Invoking Awen. One of the most simple things to do is to invoke Awen regularly as part of your practice. Druids are good at this, and if you are a druid, chances are, you know how to chant “Awen.” For everyone else, the chant is simple. You open up your chest and let all the air in, and then you ring out, strongly and surely, three syllables: “Ah – Oh – En.” And you repeat that as long as you’ d like. You can sing it, you can dance with it. And as you chant that sacred word, imagine yourself opening up to that flow of inspiration. You can chant it anywhere you like. You can get a group and chant together, or “cascade” it by having each person chant Awen at a slightly different time. And then once you’ve invoked it–do something with it! Visual representations. Visual representations of Awen (the three rays of light) are powerful ways of bringing awen into your life. You might have a drawing, or another kind of image, to help bring the awen into your life which you regularly see. Druids are often spotted with Awen necklaces–I like to keep an awen symbol on my person as much as possible, preferably, close to my heart. 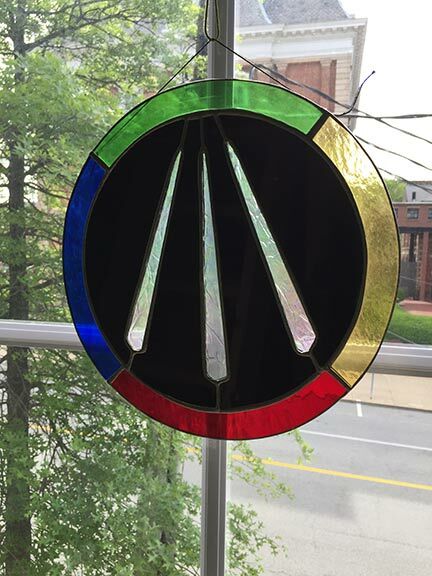 I also have an awen in a window that was a gift of a friend–the sun shines through it, literally, letting the three rays of light of the awen come into my space. Talk about powerful magic! Letting the awen flow. The key to cultivating awen, at least for me, seems to be about allowing it to flow regularly, not damming it up. Perhaps you’ve met people, or youv’ve been one yourself, who stop the flow of awen or who only allow a small tricke to flow forth. They say things like, “I’m not creative” or “I don’t have time for my [bardic art of choice]” or “I could never do that” (we will explore these issues in more depth next week). Words have power, words are magic. And saying this is like putting the flow of awen behind a dam. Maybe, if you are lucky, it will collect there, welling up, and one day, explode outwards like the dam bursting forth (this happened to me in my mid-20’s, and it was a really liberating experience!) But maybe, it will dry up and go stagnant there, and your Awen will become like a dry and parched river bed. The other piece to letting the awen flow is cultivating the right environment. For some, that means a quiet place free of distractions where they can allow their awen to flow forth and setting aside enough uninterrupted time to “get into the work” and let something beautiful emerge. For others it might mean bringing together a community to practice their bardic art, or surrounding oneself with other people who are creative. It also means enough rest and self care to be one’s best to allow this work to happen (I, for one, can’t create when I’m exhausted). Relinquishing control. And then there are people who want the awen to flow, but try to maintain all control and send it off in directions. You can’t always force it, you have to work with it and respond to it, just like that expert kayaker navigating a flow of water. As an artist, writer, and occasional musician, for me this means setting aside regular time to create, but allowing most of that to be unstructured time. So I know I will create and have time set aside to do it, but until that day, I’m not sure what I will create: will I paint? What will I paint? Will I play my flute? Will I write? And when I begin, I let the flow go as long as I can. I don’t try to impose my will on it too strongly, but rather, let the awen guide me. Its almost like there’s a second hand on my paintbrush, and if we both work together, it will work well, but if we don’t, it will be trouble. The Many Forms of Creativity. I’ve been talking in my examples about traditional bardic arts: writing, painting, music, storytelling, dance, and so on. But Awen can flow through us and be directed towards all kinds of things, not all of which would be considered “bardic arts” in the traditional sense. For example, I allow Awen to flow when I’m planning my lessons for my university teaching through creative activities and creative planning. I know friends who do lots of building and allow the awen to flow with their design work, their creative use of old materials and curbside treasures, and their finishing techniques. Others are culinary wizards in the kitchen and make amazing and beautiful meals. Still others are master gardeners who create a palate with plants. Once we realize that awen can be applied to more than just the traditional bardic arts, but we can, essentially, lead inspired lives–then the real magic begins! May the flow of awen, of creative inspiration, come into your life! Next week’s post will delve more deeply into the Bardic arts and how to take up the path of the bard. lrick de Burgh, Earl of Clanricarde (1604–1657), Memoirs of the Right Honourable the Marquis of Clanricarde … containing several original papers and letters of King Charles II, queen mother, the Duke of York … &c. relating to the treaty between the Duke of Lorrain and the Irish commissioners, from February 1650 to August 1653. Publish’d from his lordship’s original mss. To which is prefix’d, a dissertation … containing several curious observations concerning the antiquities of Ireland. London, Printed for J. Woodman, 1722. Thank you,dear Dana! Very mindful post! Thank you! You are most welcome! By the way, is there anything in Druidic tradition concerning the sounds combination ‘ku’? For many peoples it used to be sacral & had a magic power. Not that I know of. You might check out JMG’s new book on the Coelbren (I’m not sure if Ku is used specifically, but if it had any tie to the druid tradition, that would be where I’d start looking). I haven’t gotten his new book yet, but hopefully will have it soon! Thank you for the information! I will check! 🙂 You can find the information about KU in Khazar’s traditions as well as in other tribes of the area. That sounds great :). What are you planning on doing? I will email you! (I can see it in the comment info on the back end of WordPress). Reblogged this on The Dreaming Path. A lovely read! Thank you for your inspiring thoughts! One of the lessons I’ve learned about being prepared for Awen (though I’ve only known that word recently) to flow is to regularly practice, have my skills sharp, and to seek out teachers who can cultivate skill and provide feedback, all so that I’m ready to go and can get closer to realizing my vision when inspiration comes. Yes, absolutely! I’ll actually be covering more in depth about issues of practice and talent in my two upcoming posts :). Thanks for the comment! I’m looking forward to it. Bless you! I have just been introduced to your wonderful blog, loving it. As a hedgewitch i pretty much believe that you live the ‘Awen’ 24/7. Then when im painting, ritual or whatever, i bring up different energies through this physical body we find ourselves in. I think the different energies of the Awen, as expressed through the body, depend on things like astronomy / astrology, where we stand on the planet, what we make of our physical bodies and the chemicals in our brain. These are of course highly subjective thoughts. They possibly show the difference between Hedgewitchery and Druidism, in my eyes. Absolutely! I’m so happy that you found the blog–and thanks for commenting. I believe that we are living the Awen with each day, and we can live inspired, connected, and creatively. For druids, all aspects flow from nature (which includes things like astrology, as the sun, moon, and stars are also part of nature) and also from the living earth. Yes! Different paths from the same source. Cultivating the source makes me also think of Jung’s ideas on individualisation. I believe when u have been on the path solitary, as i have been, your path becomes your own. Just re-posted this to The Crane Book of Wisdom.